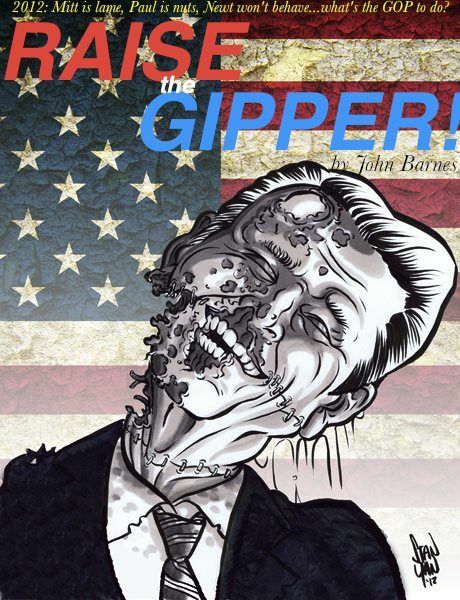 Zombies, aliens, the 2012 presidential race, an unlikely romance or two, all in a biting little satire. A quick, funny read! A brand new novel, available in ebook format only, by the acclaimed author of ORBITAL RESONANCE and MOTHER OF STORMS (if you're a sci fi person), TALES OF THE MADMAN UNDERGROUND (if you're into young adult), DIRECTIVE 51 (if you like politics), and many, many others. Wild political satire as the Republicans, caught between a Mitt and a pack of maniacs, decide that the way out is to run the guy they really want to run -- dead or not, 22nd amendment be damned!Along the way there's a little bit of romance, and a lot of goofiness. I had a blast writing this one. About 71,000 words and it reads fast.